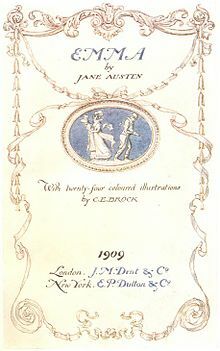 Emma (1816) is a comic novel by Jane Austen, generally regarded as the most perfectly constructed of all her works, concerning the perils of misconstrued romance. Chapter 1: The opening sentence. Chapter 5: Mrs. Weston to Mr. Knightley, on Emma. It is always incomprehensible to a man that a woman should ever refuse an offer of marriage. A man always imagines a woman to be ready for anybody who asks her. Chapter 8: Emma to Mr. Knightley. Chapter 8: Mr. Knightley to Mrs. Weston. Chapter 9: Emma to Mr. Woodhouse. Chapter 10: Emma to Harriet Smith. Chapter 11: Emma, thinking of Mr. Elton and Harriet Smith. Chapter 12: Mr. Woodhouse to Isabella. Chapter 13: Emma, thinking of Harriet. It was a delightful visit—perfect, in being much too short. Chapter 13: On visit of the John Knightley family to Hartfield. Chapter 18: Mr. Knightley to Emma. Chapter 18: Emma to Mr. Knightley. It is such a happiness when good people get together—and they always do. Harriet was one of those, who, having once begun, would be always in love. Chapter 4: On the interest of the Highbury community in Augusta Hawkins (Mrs. Elton). Chapter 5: Mr. Weston to Frank Churchill. Chapter 6: Frank Churchill to Emma. I do not know whether it ought to be so, but certainly silly things do cease to be silly if they are done by sensible people in an impudent way. Wickedness is always wickedness, but folly is not always folly.—It depends upon the character of those who handle it. Mr. Knightley, he is not a trifling, silly young man. If he were, he would have done this differently. He would either have gloried in the achievement, or been ashamed of it. There would have been either the ostentation of a coxcomb, or the evasions of a mind too weak to defend its own vanities.—No, I am perfectly sure that he is not trifling or silly. Chapter 8: Mr. Knightley to Emma. A mind lively and at ease, can do with seeing nothing, and can see nothing that does not answer. Chapter 9: Description of Emma observing the daily activities in Highbury. The ladies here probably exchanged looks which meant, "Men never know when things are dirty or not;" and the gentlemen perhaps thought each to himself, "Women will have their little nonsense and needless cares." Chapter 11: Contrasting reactions to the rooms at the Crown Inn as the site for the Westons' ball. I am very sorry to be right in this instance. I would much rather have been merry than wise. Chapter 12: Emma to Frank Churchill. Jane Fairfax is a very charming young woman - but not even Jane Fairfax is perfect. She has a fault. She has not the open temper which a man would wish for in a wife. Chapter 15: Mr. Knightley to Emma and Mrs. Weston. Chapter 16: Mr. John Knightly to Jane Fairfax. Young ladies are delicate plants. They should take care of their health and their complexion. Chapter 16: Mr. Woodhouse to Jane Fairfax. Can you trust me with such flatterers?—Does my vain spirit ever tell me I am wrong? Chapter 2: Emma to Mr. Knightley, who is leaving her to "her own reflections." Chapter 2: Emma, thinking critically of Mr. Weston. It was badly done, indeed! You, whom she had known from an infant, whom she had seen grow up from a period when her notice was an honour, to have you now, in thoughtless spirits, and the pride of the moment, laugh at her, humble her–and before her niece, too–and before others, many of whom (certainly some,) would be entirely guided by your treatment of her.–This is not pleasant to you, Emma–and it is very far from pleasant to me; but I must, I will,–I will tell you truths while I can. It was badly done, indeed! She was vexed beyond what could have been expressed—almost beyond what she could conceal. Never had she felt so agitated, mortified, grieved, at any circumstance in her life. She was most forcibly struck. The truth of his representation there was no denying. She felt it at her heart. How could she have been so brutal, so cruel to Miss Bates! How could she have exposed herself to such ill opinion in any one she valued! And how suffer him to leave her without saying one word of gratitude, of concurrence, of common kindness! Chapter 13: Mr. Knightley to Emma. Seldom, very seldom, does complete truth belong to any human disclosure; seldom can it happen that something is not a little disguised, or a little mistaken; but where, as in this case, though the conduct is mistaken, the feelings are not, it may not be very material. Chapter 13: On Emma's response to Mr. Knightley's proposal. What did she say? Just what she ought, of course. A lady always does. She said enough to show there need not be despair – and to invite him to say more himself. Chapter 13: Description of Emma's response to Mr. Knightley's proposal. Chapter 14: Frank Churchill to Mrs. Weston, in a letter. Chapter 15:: Mr. Knightley to Emma. This page was last edited on 26 October 2016, at 19:08.